Get on the Windowpane Trend Train! One home decor trend of 2018 that I particularly LOVE is the geometric windowpane pattern. Sheets, blankets, curtains, throw pillows, towels; I like the pattern just about anywhere. It's a fun way to make neutral, basic textiles a bit more interesting with a punch of texture and visual interest. Although you can use this pattern just about anywhere in your home, I especially love using it in the bedroom. Actually, before I realized that it was a trend this year, I found this windowpane queen blanket to layer under a duvet in our guest room and, on trend or not, I love it in here! Not sure about you, but when it comes to picking out sheets, I have two nonnegotiable requirements: they must be white and they must be 100% cotton. Cotton breaths and it’s easy to keep white sheets super clean and bright. There's something luxurious about climbing into crisp white sheets after a long day. It feels like you're staying at a hotel! Even though I have high standards for white sheets, I would be more than willing to go for something a bit updated with a subtle pattern. Here are two great windowpane options to freshen and update your plain white sheets. 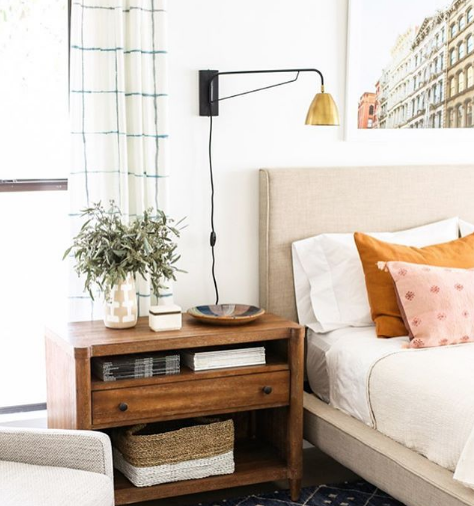 Julia swapped out her plain white sheets for this Brooklinen windowpane set. So chic and perfectly neutral! Jenny used a windowpane duvet in her bedroom and I love the eclectic mix of color and pattern. Don't you just want to swan dive into that canopy bed? Speaking of Jenny, she DIY'ed these windowpane grid curtains! How easy would this be to recreate?! Can you believe how chic and not-DIYed they look? I'll definitely be trying this sometime. Click through the link here for a step by step guide to making your own windowpane grid curtains! Here are a few of my favorite windowpane home goods right now. I even found this awesome peel-and-stick self adhesive wallpaper that would look really fun and unexpected in a small powder bathroom, water closet, or as a dresser drawer liner! Use the left and right arrows to navigate through these shoppable links. Enjoy!